The first thing you’ll notice about the N96’s version of iPlayer is how closely it resembles the desktop web version, which, in this case, is both a good and bad thing. 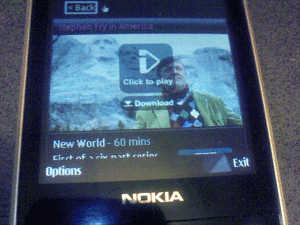 The consistent interface is welcome – the familiar ‘channels’ and ‘categories’ layout – however, to browse iPlayer content you’re required to move a cursor around the screen, the same system employed by Nokia’s mobile web browser, rather than being able to cycle directly through what’s on offer. While this doesn’t actually get in the way of accessing content, it doesn’t seem like the most efficient way of going about it. Picture quality is on par if not better than most video streaming services for cellphones that I’ve tested but didn’t seem to be quite up to the standard that I’m used to on the iPod touch. Having said that, iPlayer on the N96 is very watchable thanks to the phone’s large screen and stereo speakers. The built-in kick stand is also really useful and something I wish the iPod touch offered. Streaming iPlayer on the N96 over Wi-Fi worked pretty much as expected, although I did experience a few buffering issues, which could have been caused by either the BBC’s streaming servers (not uncommon, lately) or my own Wi-Fi network. It’s also possible to stream over 3G, although you’ll want to make sure you don’t fall foul on any additional data charges from your carrier. However, it was the download option that I was most curious to try. Picture quality was identical to streaming, which probably explains the quick download times. In the future the BBC might want to consider offering a higher quality download version as an additional option for those with faster connections. iPlayer is a great addition to the N96’s already strong media playback features, and as I noted previously, being the first mobile device to offer iPlayer downloads is quite a coup for Nokia. It also nicely highlights the limitations of Apple’s closed DRM solution, although, unfortunately, I’m not that sure most consumers will know whose to blame. 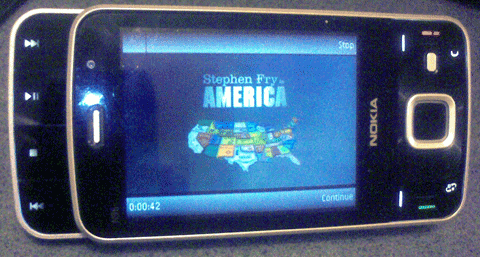 Note: some users have worked out a way of getting iPlayer for N96 to work on other S60 devices. hello can i just buy this phone 120.